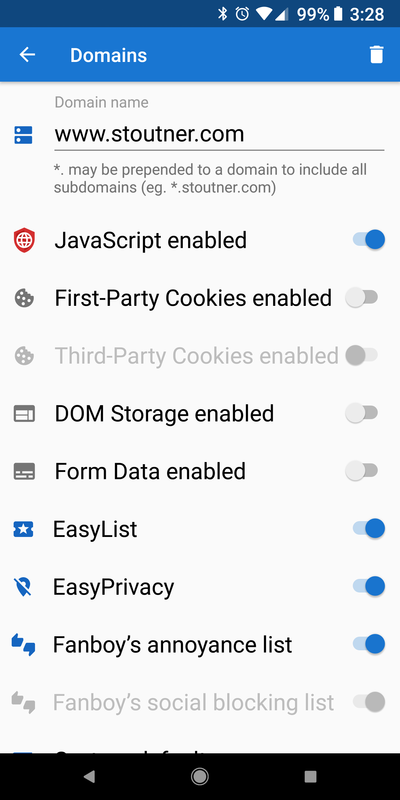 Privacy Browser 2.9 has been released. The major change is that the write storage permission has been added as was previously announced in the roadmap. 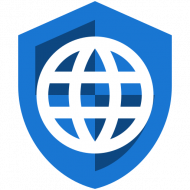 This allows downloads to be stored in the public download directory, and will also allow for a number of other planned features, like the import and export of settings. It is now possible to control the block lists in domain settings. This allows a block list to be disabled if it there is a false positive on a particular domain or if the user wants to financially support the domain by viewing ads. 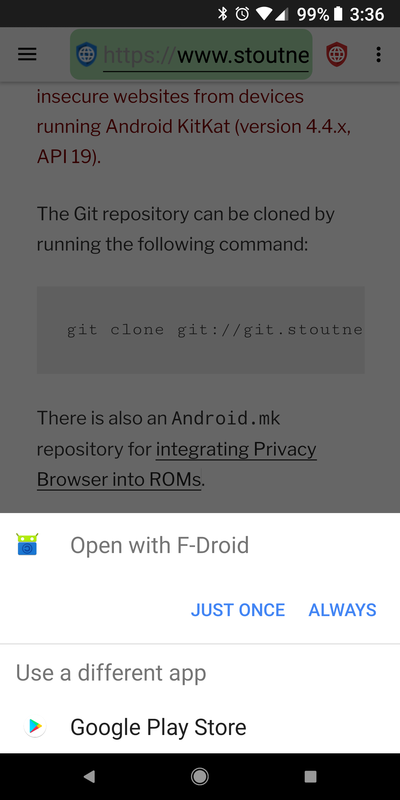 Custom URLs are now referred to a chooser to open in other apps. This allows, for example, market:// URLs to open an app store or oauth2redirect:// URLs to complete the Mastodon signup process. 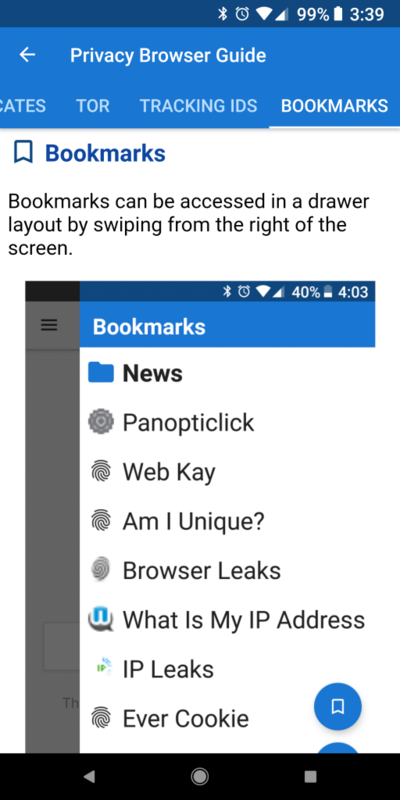 A bookmarks tab has been added to the Guide. Some users, understandably, have difficulty finding the bookmarks. Hopefully, this will point them in the right direction. 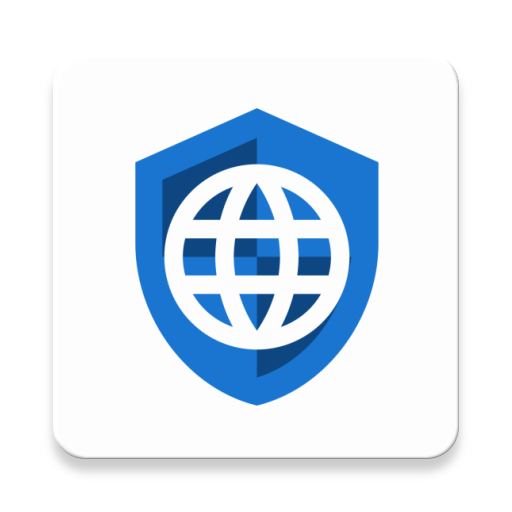 Privacy Browser now has an adaptive icon. This is something I initially resisted doing, but it is the way everything is going on newer devices. It also allows me to replace the bitmap launcher icons with vector ones, which are smaller and allow for perfect layout on all devices. 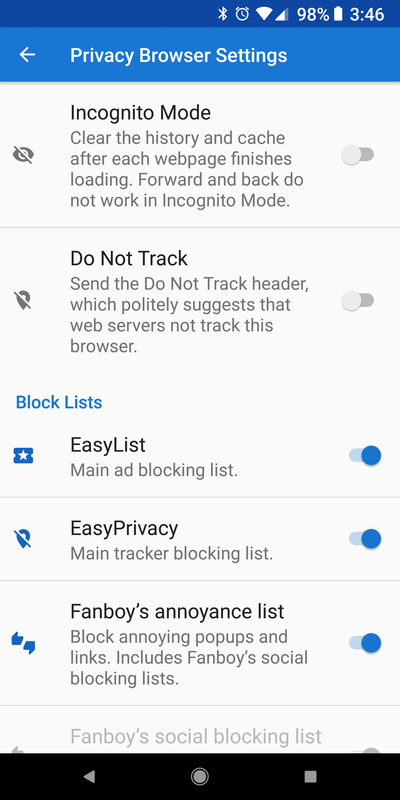 There is now an explicit warning for users of Incognito Mode that forward and back do not work when it is enabled. Previously it wasn’t clear to many users that if the history was deleted forward and back would not work. The favorite icon is now preserved when returning from the settings or domains activities. Cookies are now no longer erroneously deleted in Incognito Mode. And the webpage is no longer reloaded when restarting Privacy Browser from the launcher. 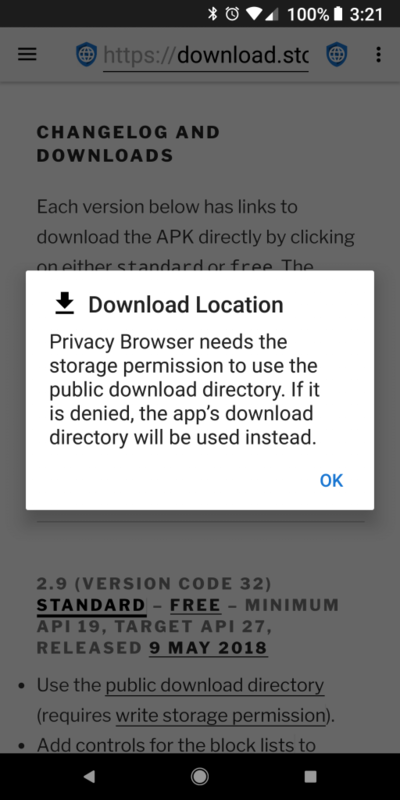 Privacy Browser 2.9 contains the first full Russian translation. Francesco Buratti provided an updated Italian translation and Jose A. León provided an updated Spanish translation. Stefan Erhardt provided a partially updated German translation. I am grateful for all their time and effort. The next release of Privacy Browser will add the read storage permission which will allow for the uploading of files to websites. It will also have a block list activity that shows details about every request that is blocked. This will be useful for determining if a resource is incorrectly blocked, as well as for ascertaining what websites are doing to track users.